After working three days in a row and also having some rain, I hadn't been doing enough checking on my flowers, I guess. One whole beautiful blossom among the carnage. The other barrel planter was not quite as bad yet! 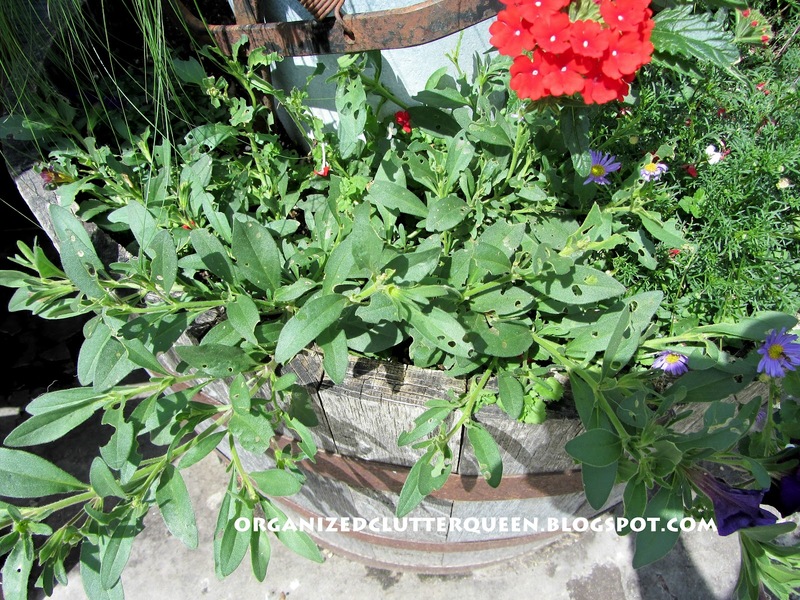 Budworm caterpillars prefer petunias, geraniums and nicotiana. They like to chomp on the blossoms first, and then the foliage. They do not become butterflies. They become moths. I have been picking them off with my fingers. Some are quite big and fat but most look just hatched and pretty small. I am not squeamish about picking them off with my fingers. Not sure if I got most of them or not or if I should try some kind of poison. Update: The neighbor thinks they are cutworm caterpillars, and I did buy some spray ortho that said it was for caterpillars. I don't think I can pick them all off! 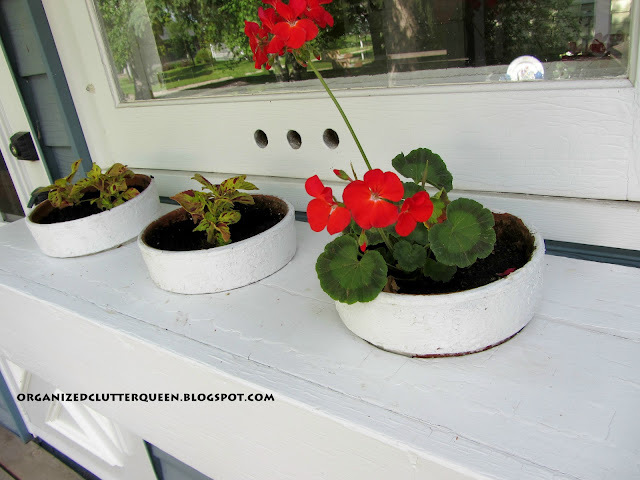 Several of my window box geraniums had been attacked. I purchased $1.49 seed geraniums from Kmart for the window box pots. Normally with a little fertilizer and warm weather, the seed geraniums do well and are quite large by the 4th of July. 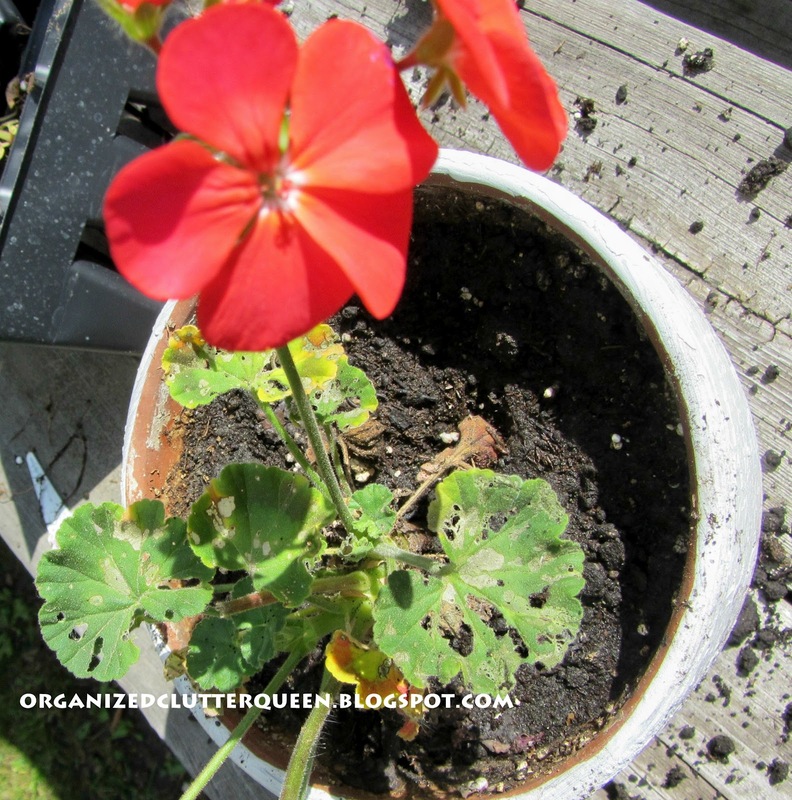 As you can see some of the geraniums were okay but I went ahead and planted the geraniums in a flowerbed and planted 2 bedding coleus plants in the 13 window box pots. Not sure how this will work out, but I would hate it if 5-6 of the geraniums didn't make it or were spindly all summer. 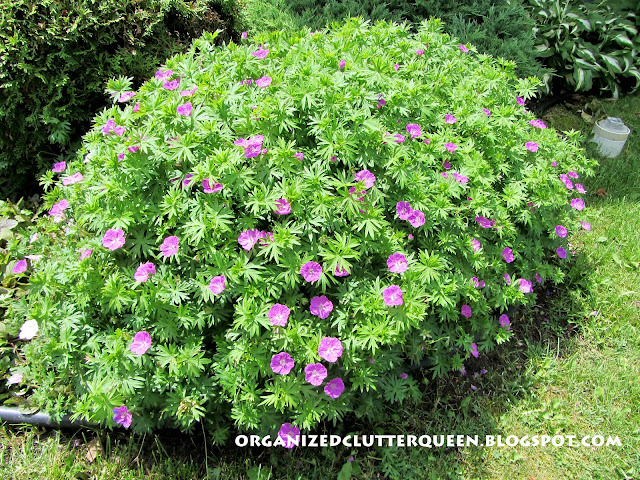 But just when gardening frustration peaks, I see a beautiful cranesbill in a nice tidy mound in full bloom. I guess I still like flower gardening! Many of you caught a glimpse of my old buggy wheel in a previous post and told me that you hoped to find an Amish buggy wheel to put inside the house. 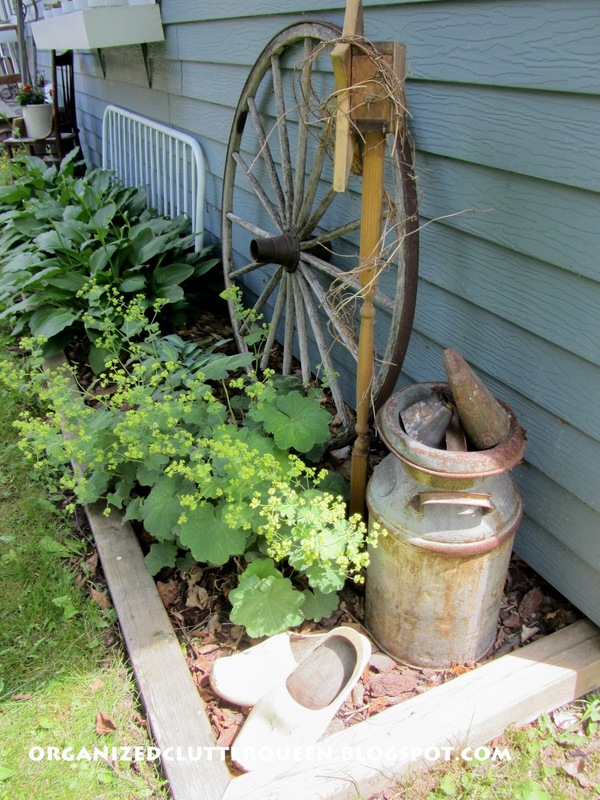 Here is mine, leaning against the siding, flanked by hostas and a cream can, and in the front, a Lady's Mantle and wooden dutch shoes. 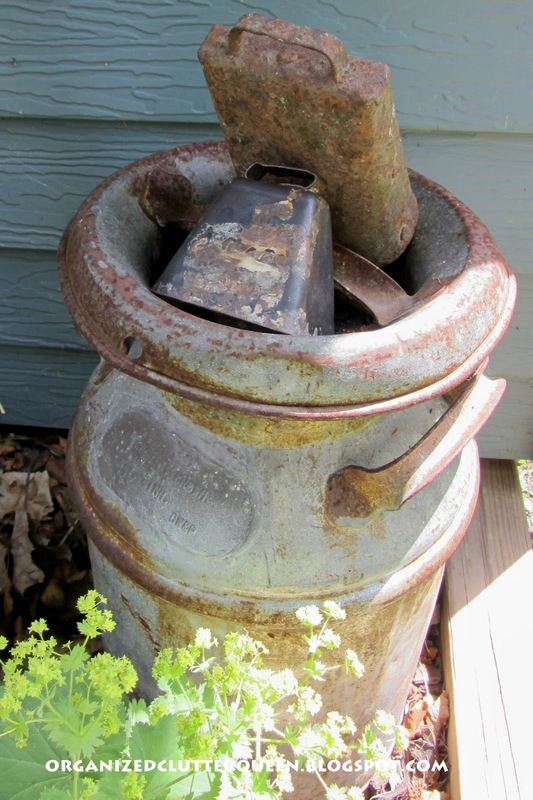 Rust is a must in a good junk garden. Rusty cow bells on the cream can. 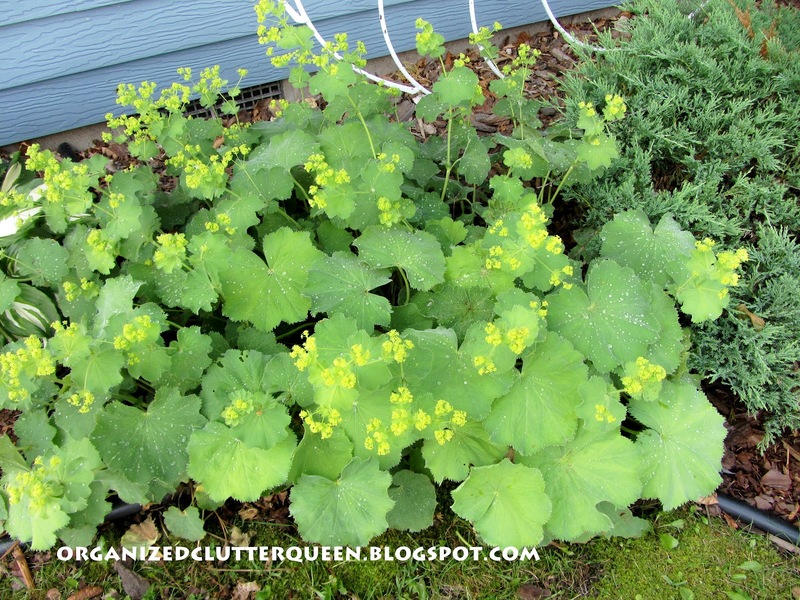 More Lady's Mantle in full bloom with rain drops sitting on the hairy leaves. 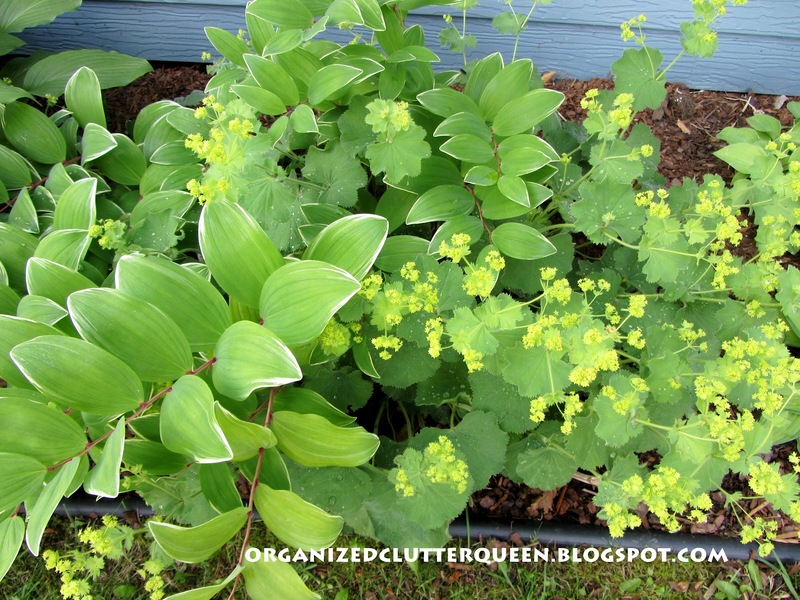 More Lady's Mantle mixed with variegated Solomon's Seal. If anyone has any advise on the budworm caterpillar problem, please let me know as it is affecting other plants too, just not as severely. That stinks. The deer here are my invaders. I spray for them but just when they get nice they still get to them. I hope you can turn them around. The other flowers look good. Hope you ae having a good day. I know just how you feel....we work so hard trying to get our gardens in shape and in a few days. DEAD or EATEN! I am hoping you can get rid of the little critters....Your wagon wheel is very nice and so is your milk can. I use mine next to my patio chairs. I painted them red. they look pretty good. By the way thanks for leaving me a message on my blog. I am trying to keep up with it but somehow I get behind. Oh, no! Not another worm to worry about! I've seen a lot of dark gray moths around the house, so I'm wondering if I've got them too. Nothing is more frustrating then buying and planting pretties and then having them eaten! Totally P's me off. I get the deer here. They think I plant a buffet for them ;) Little stinkers. At least they are cute!! Carlene, sorry about those caterpillars, yikes. I'm going to check my flowers more carefully tomorrow! We have voles here, I love hostas but the voles eat the roots and then the plants die. 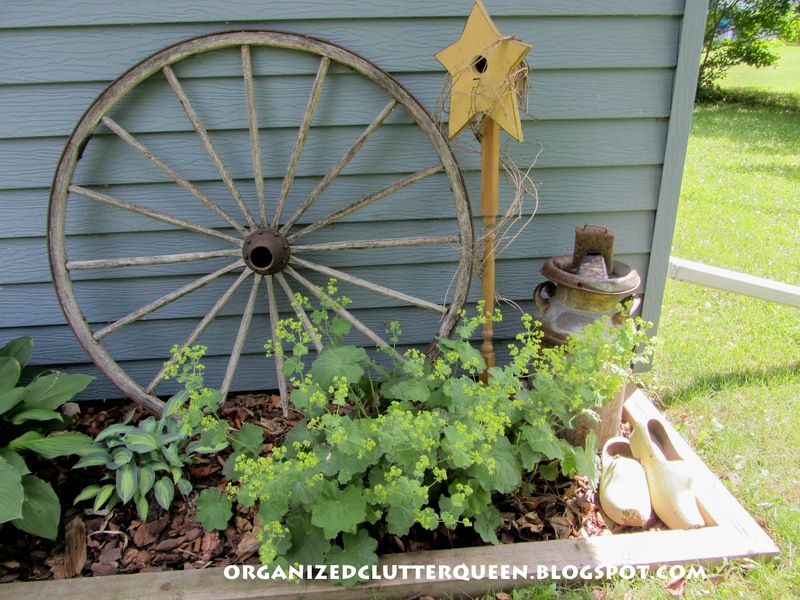 Your Cranesbill is gorgeous, and your wagon wheel looks great in the garden. Oh sorry about the damage to your garden...I am unfamiliar with that bug...wow, they can do some real destruction. 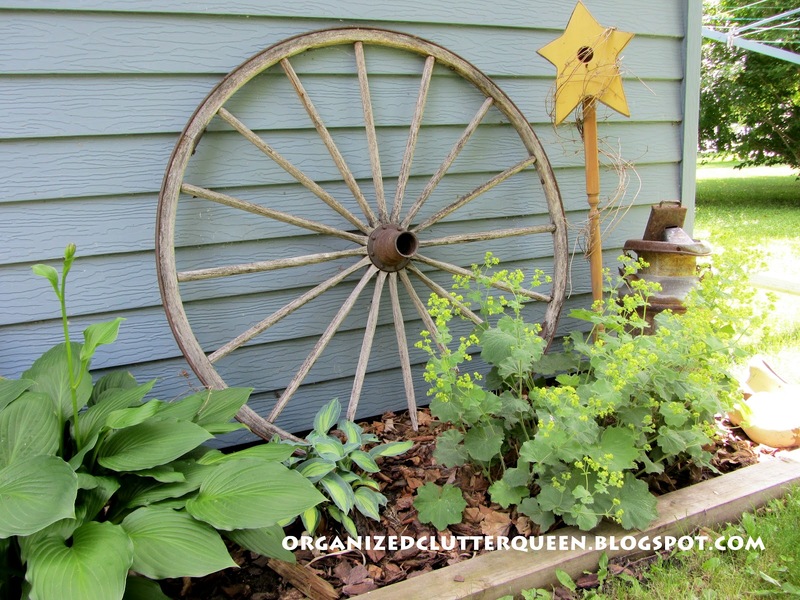 Love your items in your garden though...always have enjoyed Wagon wheels outside. Oh, no that makes me so sad to see your flowers gobbled up! Hopefully they will be able to recover. I love the garden decor with the buggy wheel and milk can etc. It a perfect country garden! You have a wonderful garden, so sorry to read about the worms We've had slugs in the lettuce this year and that has been a disappointment.The late snow killed off my tulips crocus and hyacinths too... hang in there everything still looks lovely. Hopping over from Anita's Cowgirl Up, I m a happy follower of your sweet blog. Hi Carlene, I know the frustration of little critters enjoying your pretty flowers a little too much. The ones that are thriving in your garden are beautiful. Love all your outdoor adornments like the buggy wheel and old milk can. They add a lot of character. 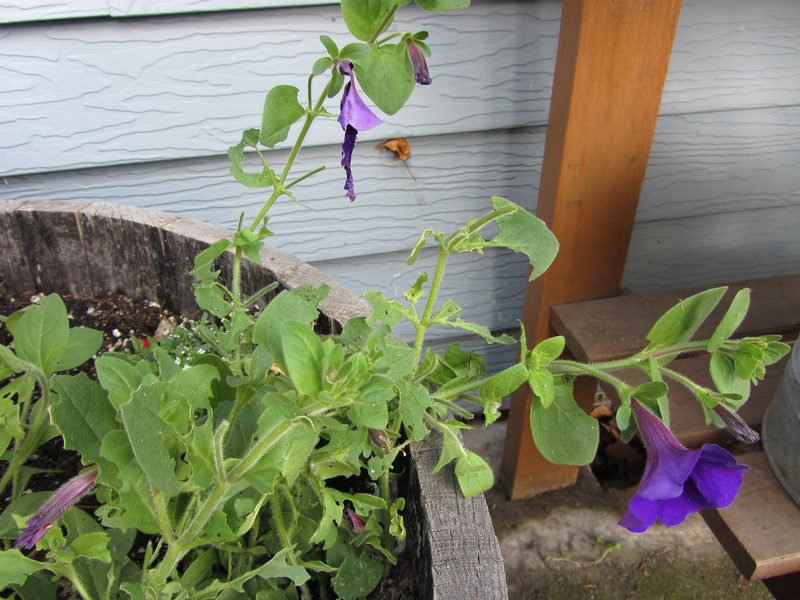 Our garden lady says mix a soapy water solution and spray your flowers if you don't want to use insecticide. I am not sure what I got rid of but it worked. Your garden is great. I like the rustic look myself and have several metal yard art items. I am just over from Kathewithane. So glad I found this. Last year we also had a moth or worm in our geraniums, they really did a number on them. My husband sprayed them with poison and that seem to do the trick. We also have a antique wagon wheel in our yard and a vintage milk can, I love it and I think it brings a lot of whimsy to the yard. I love your baby cards how darn adorable and sweet. Your garden is lovely. We have other types of critters that eat our flowers, but BT, Bacillus Thuringiensis spray will kill most catapillers pretty quickly. I should have used it this winter because we will now be enjoying butterflies instead of grapes. Oh so sorry about your garden, we used dissolved detergent soaps and spray them on top and under the leaves. However aphids and mealy bugs on ours are already plenty when we noticed and they destroyed our plants. I wish you posted the photo of the worms too! I love the composition of those violets in the mound. I know it is a heartbreak to lose flowers to worms and caterpillers, etc. I don't like to use insecticide on my plants so I make up a hot red pepper infusion to spary on them. Happy Outdoor Wednesday! Ugh! Nasty destructive pests! Taking your beautiful flowers and making them their dinner! Again, ugh! 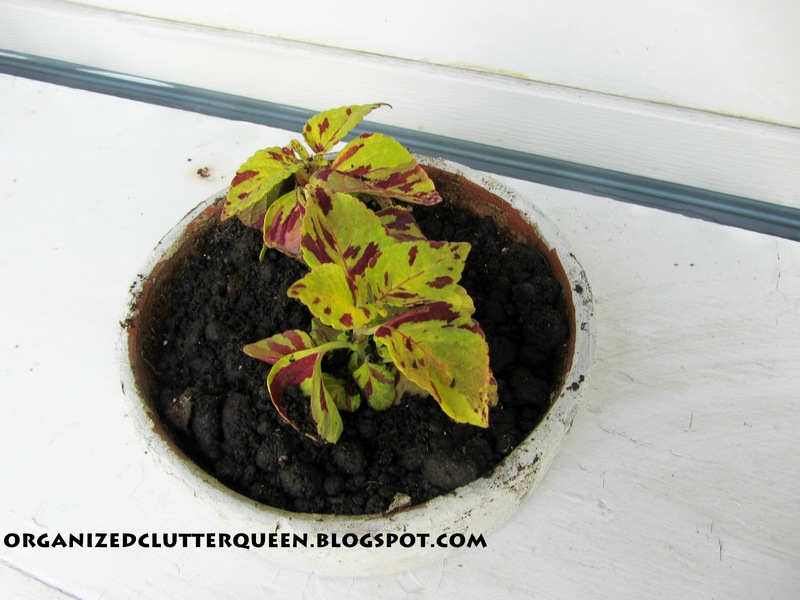 I need to find some rust for my gardens while I am out Thrifting. Yours are wonderful! Thanks for sharing again this week at the party Carlene! Love the wagon wheel ...beautiful garden! We've used dish detergent and water mix and it seems to work okay. Love your wheel and the shoes beside the cream can. So clever! Hi Carlene, I agree Rust is a Must! My old bike that I planted and both of my window boxes have had the same attack. I rarely see them on the plants. Just see half eaten leaves and blossoms each morning. I have found that the only thing that will get rid of them is Thuricide. I am going to mix some up and hit my petunias and geraniums this weekend. Love your cranesbill and Lady's Mantle. I have both and enjoy them so much. Also wanted to thank you for commenting on my guest post at the Thrifty Groove. I appreciated it! I bought a "natural" pesticide at Walmart. It is Ortho's Elemental for indoors and out but it listed tent caterpillars and many other pests but I didn't see cutworms on there. I'm sure they must have something for them and maybe this stuff I have works on them too. Im still thumbing through your old posts.....enjoying them thoroughly. 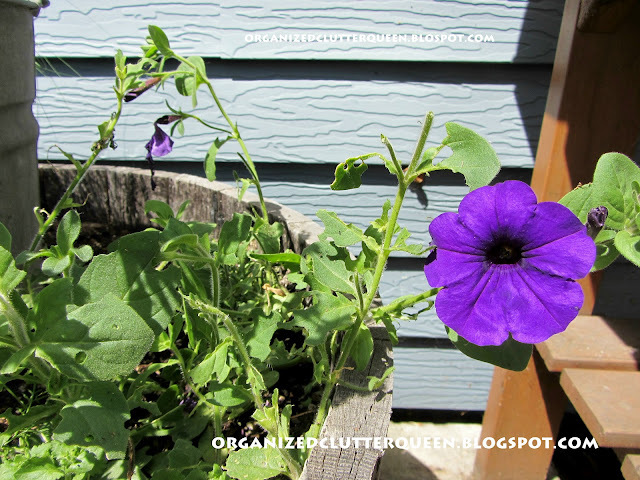 Lovin your 'junk' in your flower beds.